EAD Series Dehumidifying Dryers are used to dry and pre-heat the all important engineering hygroscopic plastic materials such as PC, ABS, PET, ACRYLIC, PBT, NYLON, SAN, DELRIN, HIPS, ACETAL, CELLULOSE, ACETATE, NORYL etc. The system works on close loop basis thus unaffected by the ambient conditions. Continuous dew point of less than (-) 55oC critical for ensuring of optimum drying. Fully automatic operation with online process display for easy monitoring. Swis msolecular sieve in beaded form. 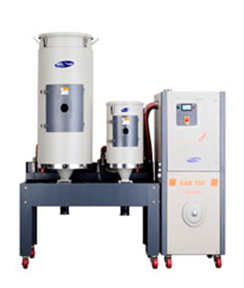 Highly efficient cartridge filters for both drying & regeneration side. Modular designs for multiple drying hoppers. Process heater bank is an integral part of insulated drying hoppers. Thus power saving. Unique air distribution system ensuring faster drying. Auto change over valve system. 7 days digital timer to plan weekly production. Heat recovery system for high heat models. Flow meter for monitoring the flow in different drying hoppers. Energy saving module avoid overheating/degradation of material. Online 'dew point' meter for monitoring dryness of the air.